The first question I get when someone looks at my photograph of Rainbow Curve is always, “Were you in an airplane?”. When I let them know my feet were on solid ground for the photograph, I then get the follow-up question of “What time did you have to start climbing the mountain”? Almost always they are surprised to know that my car is probably five feet away from where I was taking the picture. The image of Rainbow Curve in Rocky Mountain National Park is one where I was in the right spot at the right time. In September 2008, I was in Estes Park for the finale hike of the Team in Training season where I hiked Flattop Mountain. Already being in the area, I decided to stay an extra day and photograph prior to heading home. While planning the morning I was thinking of a few places which I could head to near Bear Lake and prior to sunrise started to make the drive up Bear Lake Road. I was about halfway up the road when I just thought to myself that it would be difficult to clear the cloud cover you could start to see in the pre-dawn light. In a split second, I found myself at a turnout and making a 180 for the risk of going up Trail Ridge Road for sunrise. I knew from where I was it would be about 30 minutes to get up Trail Ridge Road, and that sunrise would occur in around 40 minutes. As I backtracked and drove up Trail Ridge Road, I was wondering to myself if I had made the right decision. That was until just around treeline when I climbed out of the clouds to clear skies. The first thought was where could I pull off to capture this sunrise and that Rainbow Curve was maybe a 1/2 mile away. The area at Rainbow Curve looks back towards the east and on a clear day you can see Estes Park and out to the front range of Colorado. This morning it was just clouds. Starting to set-up for sunrise with about 10 minutes to spare other people stopped as well to see the view. Some of these people stayed for sunrise, while others continued up the road and towards Grand Lake. 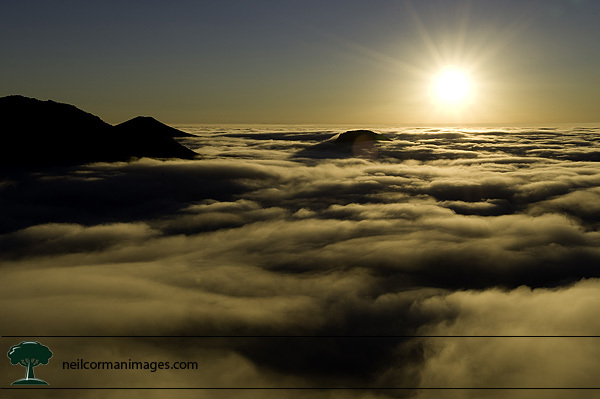 As the sun started to rise above the clouds, I looked for different compositions using the mountains rising through the clouds to give a perspective that I was indeed close to earth and not flying across country in an aircraft.